In Donatello’s workshop, Michelangelo proposes that he could officially test all of Don’s new gadgets. Don, on the other hand, doesn’t want Mike anywhere near all his hard work, such as the Turtle Launcher or the Rocket Boots. He permits Mikey to check out his other “invention”, however (which is just an ordinary fountain pen). 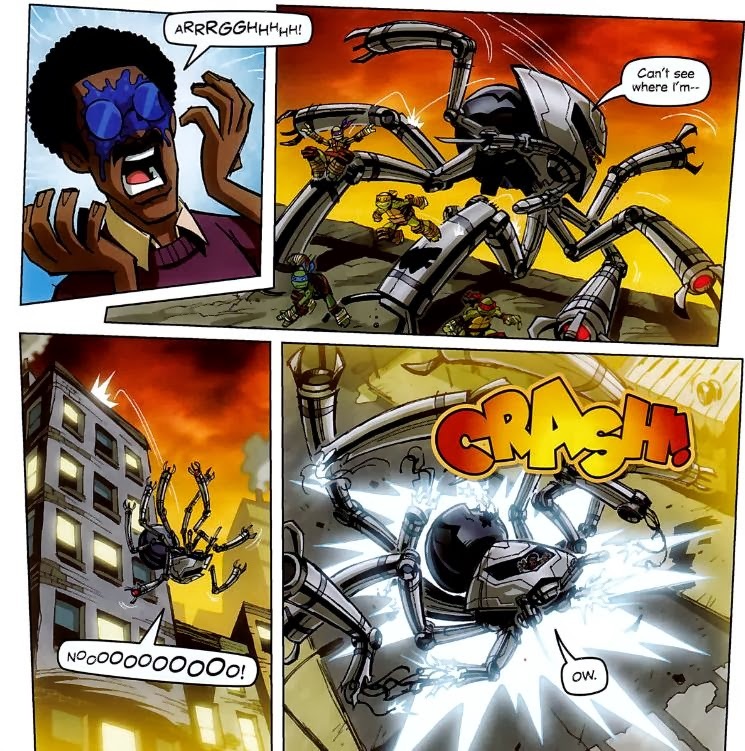 Suddenly, a TV news report comes on with grim tidings: A giant mechanical spider is rampaging across downtown New York. The pilot of the robot is none other than Baxter Stockman, wrecking havoc in an upgrade of his old StockmanPod (which Mikey dubs “Podzilla”). The Turtles immediately head out to stop him. Downtown, the Turtles confront Baxter and Podzilla on the roof of a building. Raph, Leo and Don all try to rush Podzilla, but the behemoth swats them aside with ease. 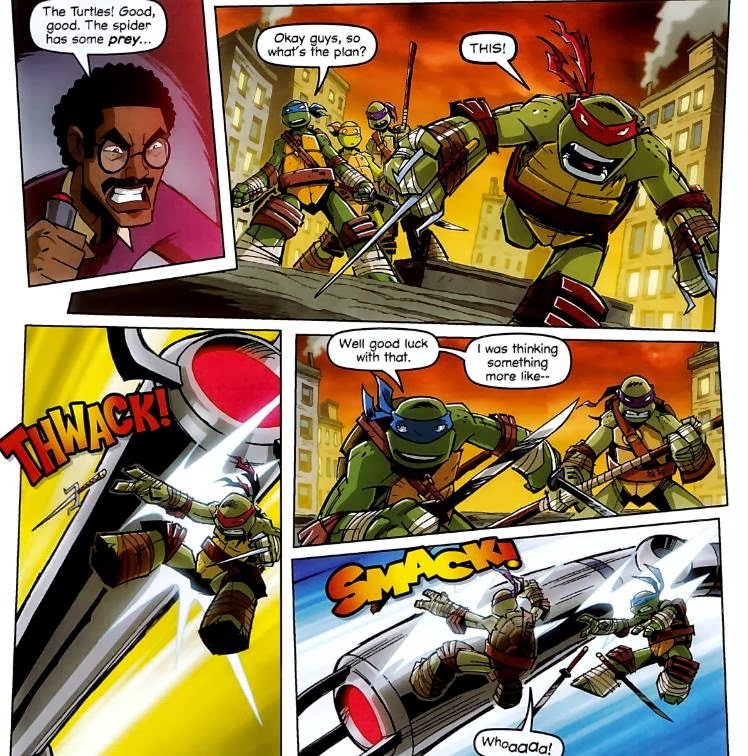 Mikey has a plan, though: He’ll use Donnie’s latest invention to defeat the robot. Of course, it’s still just a fountain pen and Mikey gets smacked. Baxter is having so much fun, he begins monologuing his glorious scheme to the beaten Turtles. Of course, from inside the cockpit of Podzilla, no one can understand a word he says. To make sure they can hear his exposition, Baxter rolls down the window to the cockpit… leaving himself wide open to a water balloon from Mikey. Furious, Baxter rolls the window back up. The distraction allows the Turtles time to each wrap one of their grappling lines around one of Podzilla’s legs. Leo hopes this will be able to knock the robot off balance. Unfortunately, they only have four grappling lines to Podzilla’s eight legs and the robot spider sends them flying with a quick twirl. It then seizes them all in its clutch and holds them up to the cockpit window. The Turtles still can’t understand Baxter, so he rolls the window down again. Mikey uses this opportunity to hit Baxter with Donnie’s “invention” (the fountain pen). He squirts ink over Baxter’s glasses, blinding him. In his panic, Baxter drops the Turtles and stumbles over the edge of the roof. Podzilla plummets down to the street below and is destroyed (leaving Baxter in agonizing pain). Back in Donnie’s workshop, Mikey is content knowing that he finally figured his brilliant new invention out. 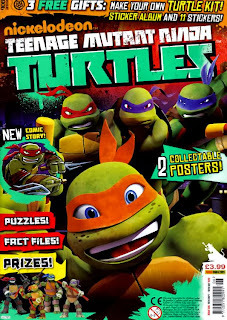 Mikey then squirts himself in the eyes with the pen, stumbles back onto the Turtle Launcher, launches himself into the Rocket Boots, then rockets himself straight into the ceiling. Donnie thanks him for testing all his gadgets at once. 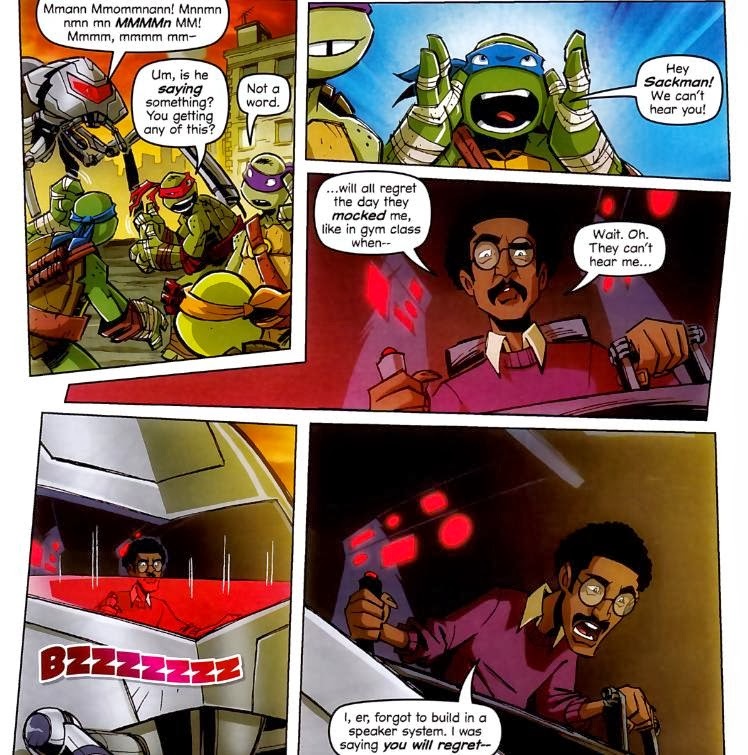 *This story is continued from TMNT Magazine (Panini) #5. 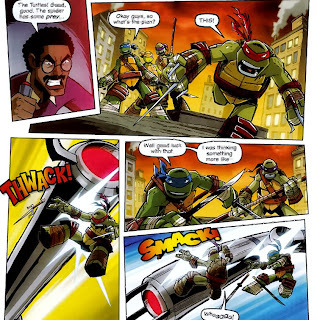 The story continues in TMNT Magazine (Panini) #7. *The StockmanPod first appeared in the episode “I Think His Name is Baxter Stockman”. 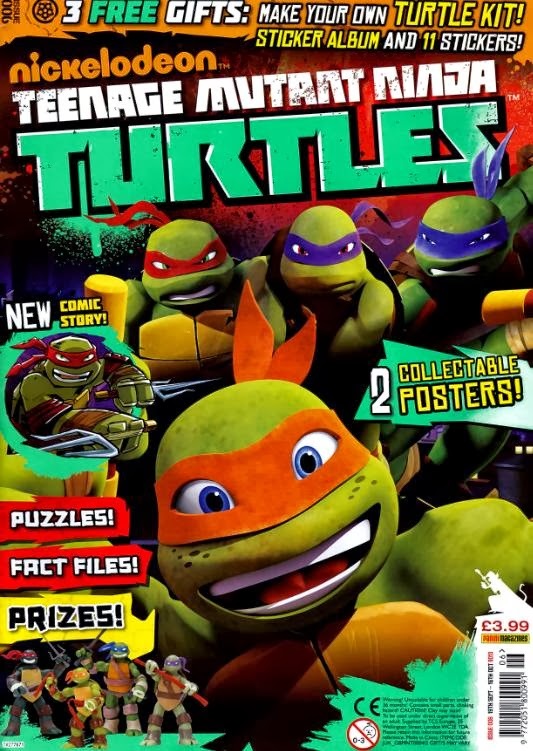 It’s nice to get a break from the Kraang, who have eaten up a few too many stories in Panini’s TMNT magazine. Baxter’s “scheme”, if you can call it that, isn’t exactly deep, but it certainly is befitting of the Nick interpretation of the character. 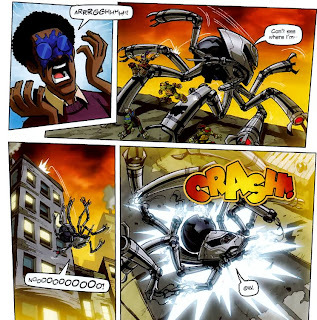 He’s a mechanical genius bent on using his brilliance to plot the pettiest of retributions, so seeing him mindlessly rampage through downtown New York in an attempt to draw out the Turtles didn’t seem particularly out of character. This is a 13-page comic, too. Not really enough room for a scheme more complex than “mindless destruction”, anyway. I’ve said it before, but I continue to be impressed with the ease in which Caruana captures the voices and idiosyncrasies of all the characters. His Baxter was right on the money, from the pathetic exposition to the self-destructive design flaws of his death machines. 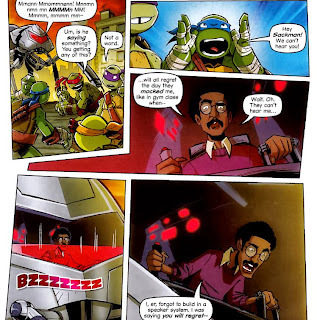 The idea that he would have to roll down the window on his giant robot’s cockpit to yell threats at the Turtles felt like exactly the sort of thing Nickelodeon Baxter would fail to account for. I think the only stumbling block Caruana’s scripts suffer from is the need for a “punchline” ending. He always sets them up somewhere near the start of the story so the finishing zinger doesn’t pop completely out of the blue, but some feel more gratuitous than others. Mikey hilariously setting off a bunch of pratfalls in Donnie’s workshop is probably one of his lesser conclusions (if this were a cartoon, it would end with an iris-out on Mikey as he stupidly mugs for the camera; that sort of thing).